Culms: Erect to ascending, simple, nearly glabrous. Blades: Basal and cauline; blades 6 to 20 (34) inches long, .12 to .2 inch wide, involute at maturity, upper surface ridged and usually pubescent, lower surface not conspicuously ridged, glabrous to minutely pubescent. Sheaths: Mostly overlapping, terete, usually glabrous, margins ciliate. Ligules: Membranous, firm, .14 to .28 inch, acute or truncate or rounded, usually entire. Inflorescences: Panicle, not enclosed in sheath, narrow, nodding, mostly 4 to 12 inches long; branches few, slender, erect, bearing 1 or 2 spikelets near tip. Spikelets: Narrow, 1-flowered, 1.2 to 1.8 inches long; glumes narrow, nearly equal, 1 to 1.8 inch long, keeled, 7-9-veined, attenuate to aristate; lemmas brown, narrow, rigid, nearly cylindric, .7 to 1 inch long excluding awn, unevenly pubescent; callus attached to base of floret, hard, .12 to .24 inch, sharp-pointed, densely pubescent, terminating in awn 4 to 8 inches long; awn spirally twisted, twice bent; palea enclosed by lemmas, prominent. 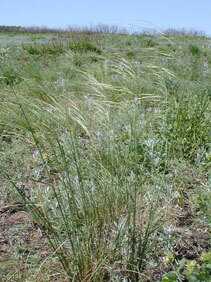 Forage Value: Porcupinegrass is a good early season forage grass for cattle and horses, but the mature awns and sharp-pointed calluses can cause mouth, eye, and ear injuries. Comments: The awns twist in dry weather and untwist in damp conditions.